Manga Review – UQ Holder! Tota and his friends dream of leaving their backwater town and climbing the tower to the capital. But they can’t leave until they defeat the powerful Yukihime, Tota’s guardian. But who is Yukihime really? And what about Tota’s parents and grandfather, a man named Negi Springfield…? I was very sad to hear Fujiwara Cocoa passed away on March 31, 2015. ANN reports that Oricon states it was due to an illness. Regardless of the circumstances, she was far too young. My condolences to her friends and family. 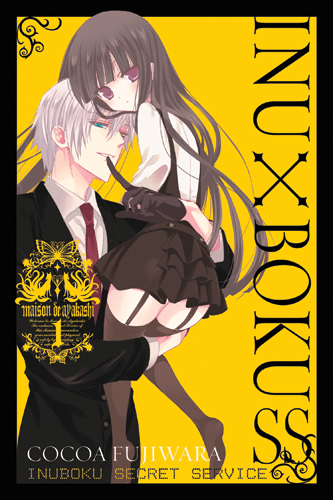 She is best known for Inu x Boku SS (review here). Yen Press is releasing the manga, and Sentai Filmworks released the anime. Other titles she has written include Dear, a series about a boy searching for the one who cursed him and a girl with a secret, and Katsute Mahou Shoujo to Aku wa Tekitai Shite Ita, a 4-koma involving an evil officer who falls in love at first sight with the magical girl who wants to defeat him. I remember reading Dear and liking it, but I don’t think I read to the end. As for Katsute Mahou Shoujo to Aku wa Tekitai Shite Ita, I was really enjoying it. It will unfortunately never have a proper ending, as it was ongoing. It had just been adapted into a drama CD. I see that her birthday was April 28th. Maybe we can make it Fujiwara Cocoa day? I think I’ll do a special post(s) involving her titles. Anybody else in? You know, read her titles, post pictures, watch the Inu x Boku SS anime, etc. Just a way to remember this talented manga author. Miko wants to inherit her family’s shrine, but she can’t see or detect spirits! One day, she accidentally shrinks the most powerful demon, the incubus Kagura, into a chibi form. Kagura won’t give up until he goes back to his regular form. But he needs love to survive! Yen Press announced a whopping 13 titles at its Sakura-Con panel. Some are going to be digital-only releases. For me, the highlight is Monthly Girls’ Nozaki-kun. It’s a 4-koma series where various crazy people directly and indirectly get involved in making a shoujo manga. It’s written by the author of Oresama Teacher and The Magic Touch. Cycling sports title Yowamushi Pedal is also attracting a great deal of excitement. Today’s covers Jinguji Ren’s route. Starish each has one route with two endings. Note that the routes seem to take place after Debut and not after Rainbow Route in All Star. Both Rainbow Route endings are considered True Love endings, but A is the one you get when your love or music meter is below 80%. Seishun Academy has a strong tennis team, but even its members are intrigued by the skill of 7th grader Ryoma. Cocky and confident Ryoma only has one goal, but perhaps the world of middle school tennis will expand his horizons. Today’s covers Hijirikawa Masato’s route. Starish each has one route with two endings. Note that the routes seem to take place after Debut and not after Rainbow Route in All Star. Both Rainbow Route endings are considered True Love endings, but A is the one you get when your love or music meter is below 80%.